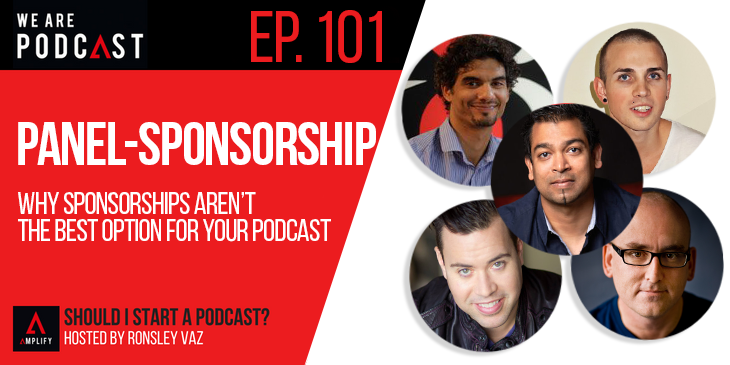 Are you considering adding sponsorships to your podcast? Before you take that you should listen to this episode of Should I Start a Podcast. When looking to monetize a podcast, most podcasters go after sponsorships to help them get started on earning some cash from their show. But is that the best way to make money off your podcast? And if so, how do you even begin to get sponsors in the first place? Live from We Are Podcast 2016 is a panel of prominent podcasters answering questions from those keen and eager attendees of the conference. The panel is made up of Omar Zenhom (WebinarNinja), Aaron Fifield (Chat With Traders), Jordan Harbinger (The Jordan Harbinger Show), Darren Rowse (ProBlogger) & hosted by Amplify’s very own Ronsley Vaz They talk about how to figure out if sponsors are worth it and how to deal with them if you do decide to run advertisements. They’ll go into the positives of having sponsors on the show beyond the money and the negatives of having them as well.